You might be excited by reading all of the information on this site about the great experiences that we offer - but there is nothing like the reviews and recommendations we received from the travelers that went on our group and tailored trips! "I had an amazing time during my most recent trip to Costa Rica! Ziplining through the jungle, horseback riding, hiking in the waterfalls, waking up to monkeys howling, milking goats, making cheese and ice cream were just some of the highlights. Most importantly this trip ignited my sense of adventure, awakened my hunger and desire for exploring the world, and once again opened up my eyes to what matters in life most. I will cherish the adventures, good times and new friendships made for a long time to come. I would recommend this trip to anyone looking for a real adventure with a Caribbean twist." "I usually plan my own vacations but decided to go with Greener Travel for our honeymoon to Costa Rica. Ami did a great job of putting together a custom-tailored two week itinerary to Costa Rica that was the right mix of adventure and relaxation! He is very detail-oriented and I greatly appreciated his dedication to meeting our needs and desires rather than pushing or selling us his own agenda. I have never had a personal travel agent before, so I was very impressed by the virtual support and attention Ami provided before and during the trip (we had a flight delay crisis that would upset the rest of our plans and Ami was available to talk/help me through it even at 10PM - I don't think any other travel agent does that!). All said, Ami knows how to create a memorable, authentic experience in Costa Rica and I would highly recommend Greener Travel for your next vacation to paradise :)"
"The trip was a nice, well-organized, and memorable experience. The variety of activities were fitted our group and our age range. People who were hosting us were kind, respectful, and considerate in all different places . I enjoyed our stay in the Finca Rio Perla farm the most because of its nature, its views, and its organic foods. In general everything was good... Thank you so much for everything." 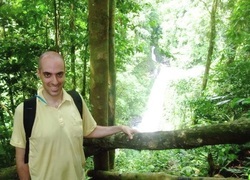 "I had the amazing opportunity to go on Ami's May 2012 Costa Rica trip! Ami's trip was great for young professionals & was the perfect mixture of non stop adventure travel to include zip lining, hiking & white water rafting & paradise leisure travel to include walks on the beach, sunbathing with a piña colada in hand & lounging by the pool! My favorite parts were zip lining in the pouring rain, Tilapia fishing on a farm & taking a night walk on the beach to see sea turtles lay their eggs! Book now with Ami & you won't regret it! See you on his next trip!" "Greener Travel will take the time to individualize the trip for you, they are not expensive (I compared prices with friends who planned a trip on their own and the prices were very close). I enjoyed the trip a lot." "This trip was an ideal way to visit Costa Rica. We got to do an incredible amount while also relaxing and finding time to absorb the atmosphere. The activities were a lot of fun, and the trip was seamlessly organized. I highly recommend it! Finca Rio Perla was a highlight of my trip to Costa Rica. Situated between the Caribbean and the mountainous center of the country, it offers a panoramic view of both areas, and is absolutely breathtaking. From riding horses to hiking to swimming beneath the farm's gorgeous waterfalls, every activity was memorable and fun. The hosts are incredibly warm and nice, and I really enjoyed the experience of living with a "real" Costa Rican family and getting a sense of how they live. In total, the four days at the farm were incredibly enriching, and also very relaxing and enjoyable. It was a wonderful way to spend the final few days of my trip before returning to work back in the US." "I did not want to get caught up in the usual trapping of commercial Costa Rica, I wanted a trip that took us to a remote (not to remote) area not effected by tourist (get there fast) . This place was amazing, my two boys age 7 and 9 where in boy heaven, horse riding and swimming in the waterfall and I could swing in the hammock and watch the humming birds in the tree next to the deck. I lived in New Zealand for 4 years and the views from the upper ridges could of been from there. This place is so special. I highly recommend it." we would have never made it to otherwise. We saw more wildlife than a zoo and had an amazing time." "Ami did an amazing job organizing my trip! I had a great time. Everything ran smoothly and he payed attention to exactly what I requested. I highly recommend his company." us places that we would have never been able to find ourselves! The Farm was absolutely incredible! The family was so nice to us, eventhough we hardly spoke Spanish, and it really gave us a taste of real life in Costa Rica, including hiking through the jungle!I highly recommend going on Ami's Caribbean Experiences, it was a fantastic adventure!" “The trip was truly an amazing experience – everything from action packed adventure to cultural immersion. Yes, horseback riding, whitewater rafting, snorkeling, and zip lining all in one week!
" This trip put many things in perspective for me, including how to live life simply but very happy. There are many different cultures in Costa Rica; everyone looks and talks like they must have come from somewhere else. Our group leader went to great lengths to accommodate us and gave us many options for food and activities. Our farm stay was a study in simple living! I lost weight on this trip just from eating only fresh food! The family there is straight-forward, honest, hard-working and very happy to have guests over; the trips such as the chocolate tour, whitewater rafting, ziplining and snorkeling all have wonderful tour guides who show a genuine love for and seemingly bottomless knowledge of their craft. Earth University piqued my interest as I have many friends in the Environmental Sciences sector. Bottom line: For every item that the trip brochure promises, it solidly delivers." "This is an amazing farm.... The good news is that there's no traffic so you can send your young children over to collect eggs or whatever with no fear anyone will be within a kilometer of a car or truck. The dishes are plastic, but the food on those plastic dishes is amazing, Vivian is a masterful Costa Rican cook, and a lovely and patient person. I have to say, we had a great time all over Costa Rica, but really nothing as amazing as milking a cow and by the end of the day eating ice cream made from that very milk. And the ice cream, like all the food, was just so good. As I say, it's not for those looking for a luxury experience, but if you embrace it, the Finca is magical." 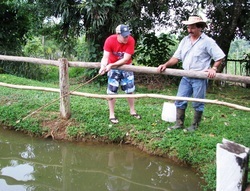 Jon fishing at Finca Rio Perla's tilapia ponds! NOTE: Greener Travel set up our whole trip to Costa Rica; we spent 3 days in San Jose, 2 days in Puerto Viejo, and 2 days at the farm, Finco Rio Perla."